The call was made from Christian charity, Sports Chaplaincy UK, which reports there are 151,000 sports chaplaincy opportunities across the country, and an openness as local sports clubs begin to understand the value of chaplaincy. 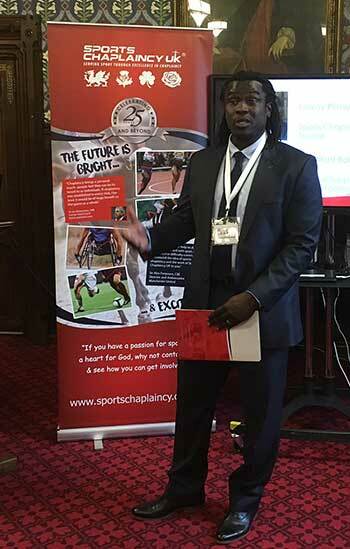 Sports Chaplaincy UK held a special parliamentary reception last Thursday (7 September) to mark its 25th anniversary and relaunch its vision to the Church. The charity was originally called SCORE and pioneered by Baptist minister the Revd John Boyers, after a desire to see Christians impacting football clubs. To date the charity has trained around 500 chaplains, who provide spiritual and pastoral care in a range of sports. But while it has a high profile in elite sports, notably football (John Boyers famously became the chaplain at Manchester United), rugby union and rugby league, it remains little known in the Christian community. With denominations, ecumenical organisations and media invited, the anniversary reception was an opportunity for the charity to celebrate what has gone before, and share its vision of chaplain in every sports club. The reception was hosted by the Rt Hon Stephen Timms MP, the Chair of the All Party Parliamentary Group for Faith and Society. In his opening remarks, Stephen Timms MP praised the work of Sports Chaplaincy UK as a "fantastic example" of what the group seeks to champion, and applauded the ambition of seeking sports chaplains around the country. Sports Chaplaincy UK chief executive Warren Evans told those gathered at the Reception that "a chaplain is simply an expression of God’s love and compassion and I believe God has given us a dream – to see an expression of his love and compassion in every community called sport". Warren Evans also talked about the huge numbers involved in sport and gyms. There are 151,000 sports clubs. While numbers vary, each would typically have around 80 adults and 90 children, which equates to around 25 million people. In addition, the UK has nearly 7000 gyms. While much sporting activity takes place on a Sunday morning, Sports Chaplaincy UK believes churches need to be flexible to reach it. Warren Evans added: "I don’t believe we should be rejecting a community six times our own because it meets at the same time as us. "Let’s be creative – hold services two hours later, do a barbecue once a year, pray for the clubs ­– come up with something in your context." Warren encouraged Christians to see the community of sport as God sees it. While outwardly they may look healthy and wealthy, all are human being with spiritual needs. "Sport is a mission field. The church should be there. Let’s not waste this opportunity." The charity seeks to find a club or sporting organisation ready to embrace sports chaplaincy, and identify the right person for the role. It has an initial goal of training 1,000 new chaplains as it sets about its dream of seeing a chaplain in 'every community called sport'. Matt Baker, Pastoral Support Director in English Football, said clubs were becoming aware of the value of chaplaincy. He spoke of being invited by a rugby club to be its chaplain, as the club recognized there were many in its ranks with pastoral issues. ​There was also mention of another club with an atheist in charge who nevertheless introduced chaplaincy. "Though she wasn’t a believer, she could see the value it brought," Matt emphasised. The reception also heard from former footballers Paul Elliott CBE MBE and Linvoy Primus MBE. Paul Elliott, whose own career was ended by injury when he was 28, spoke of the importance of having someone who is interested in the whole person, not simply from a playing point of view. Linvoy Primus (pictured above, speaking at the reception), who played in the Premier League with Portsmouth and came to faith during his time on the south coast, said his family chose sport over church on a Sunday morning. Linvoy Primus said: "My children were lonely in church as all their friends were playing sport. It was a difficult decision, but we chose sport. "But as I was standing there with other parents, I thought why can’t we have someone here? I want to let Christians know we don’t have to be in the building."